Squadron 113 is up and running. Our first meeting was held September 11, 2018. It was well attended and the groundwork has been put in place with some exciting programs for us to participate in. 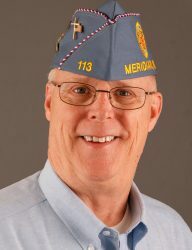 We meet in the Veterans Memorial Building, 22 W. Broadway in Meridian at 1900 the second Tuesday of each month. All members and prospective members are cordially invited to attend. I would like to remind everyone that there is no minimum age required for membership in SAL. We are actively looking for youth of all ages to join and participate in this wonderful organization. The Commander’s emphasis on training will be on two areas, and practicing that training by participating in community affairs and projects. Member training will focus on The Five Point Program consisting of Patriotism, Citizenship, Discipline, Leadership, and Legionism as well as The Ten Ideals of Patriotism, Health, Training, Knowledge, Honor, Faith, Helpfulness, Courtesy, Reverence, and Comradeship. Medals are presented to the SAL members who master these programs. If you are not already a member, please click on the button below to check for membership eligibility. We would love for you to join us.